Matt C: To my surprise, I’ve engaged with the Secret Wars event far more than I anticipated. 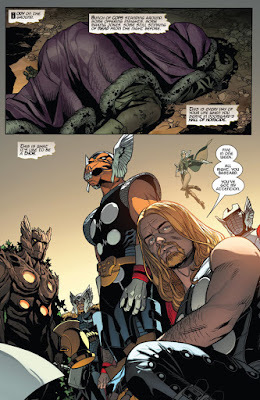 I was confident that the core series would deliver, based on Jonathan Hickman’s excellent work over the last couple of years on Avengers and New Avengers (which dealt with the storyline that led directly into the creation of Battleworld), but I had sort of dismissed the various tie-ins as either pointless or superfluous, and unlikely to have any effect on how the central narrative progresses. This was a frequent point of conversation over the last few months between various members of the PCG: why do we need these books, what ultimate purpose do they serve in the grand purpose of things? Of course, I’ve gone on to pick up a bunch of these tie-ins and, on the whole, I've enjoyed them immensely, which led me back to that question: why do we need these books? The answer is blindingly obvious: because they provide the potential for great stories. There’s a larger issue of how we ascertain what exactly we’re looking for when we buy books from the Big Two. Primarily, it’s the characters. Maybe the creators too, but those iconic characters are what lead us to mainstream Marvel and DC comics. And that earlier question can be applied again: why do we need these books? Think of your own answer to that question for a minute. That’s a whole other discussion in itself, but I’m pretty sure whatever you came up with can also be used to answer why do we need these Secret Wars tie-in books. Unless of course your answer is something along the lines of ‘a slavish adherence to established continuity’ or ‘an endless recycling of ideas and plots’. Okay, so you may or may not have anything against those two reasons - they may even hold some importance to you - but I very much doubt they’re higher up the scale than, say, the enjoyment and entertainment value a superhero-themed comic book story can provide. What I’m trying to say, in a very long-winded manner, is it was wrong to dismiss these tie-in books because they don’t, for want of a better word, ‘mean’ anything. If we believe a ‘meaningful’ story can only be one that stays within certain expected parameters and focuses on familiarity, then there’s definitely something we're missing somewhere along the line. Case in point: Thors #1. It’s been established that the police force patrolling Battleworld is populated by various incarnations of the Odinson, but their function in Secret Wars proper is more as muscle, the personification of Emperor God Doom’s absolute law. What more do we need from them? Do we need anything more?? Well, if you have a writer with an idea, and that idea is a great idea, then it should become a valid proposition. And Jason Aaron has clearly got a great take on how to fashion a story with these characters as well as the experience in dealing with all things Asgardian. I stuck with Aaron’s Thor: God Of Thunder series but bailed on his follow-up with the female Thunder God (which I’m thinking, in hindsight, was probably the wrong decision). He clearly has a great grasp on the Odinson’s mythos, mixing sword and sorcery tropes with superhero staples with ease, and here he takes all that and bundles it up with that most well worn of genres, the police procedural. 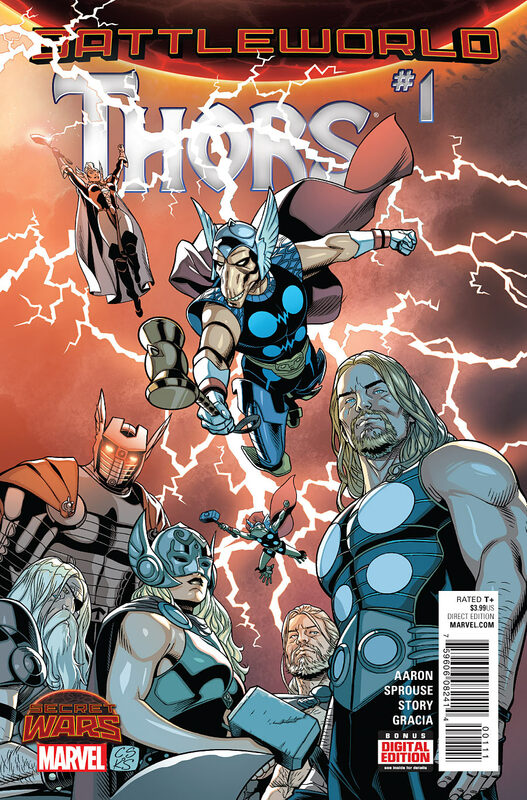 Rather than using elements of the cop drama template and superimposing them onto Thor’s milieu, this is, at its core, a ‘detectives on the trail of a serial killer’ tale, and it works all the Asgardian/ Battleworld stuff into a solid, absorbing storyline that slides familiarity inventively into something that contains plenty of fanboy nods and winks but still grounds everything through strong characterization and incident, avoiding the ‘gimmick’ tag. Sprouse’s moody artwork isn’t overly flashy, emphasising the crime drama atmospherics but not at the expense of the more fantastical elements, and Aaron’s script indicates he’s entirely familiar with the construction and dynamics of the very best cop thrillers.